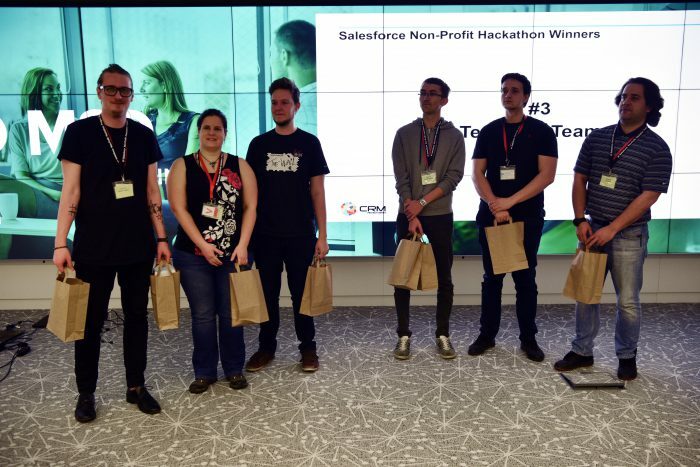 10 teams, 4 NGOs, 24 hours for delivery – basic ingredients of the first Salesforce hackathon in Czech Republic. I got the honor to be a mentor and sit in the jury, selecting the winner of this great event. I did attend a few hackathons before and this one was different due to a several reasons. Reason #3 being that teams were allocated to the tasks by lot, not by choosing what they want to do. And what really surprised me was that none of them left after finding what they should deliver, as some of the tasks were pretty complex. Just one team gave up during the night, as they had just 6 months of experience with Salesforce. 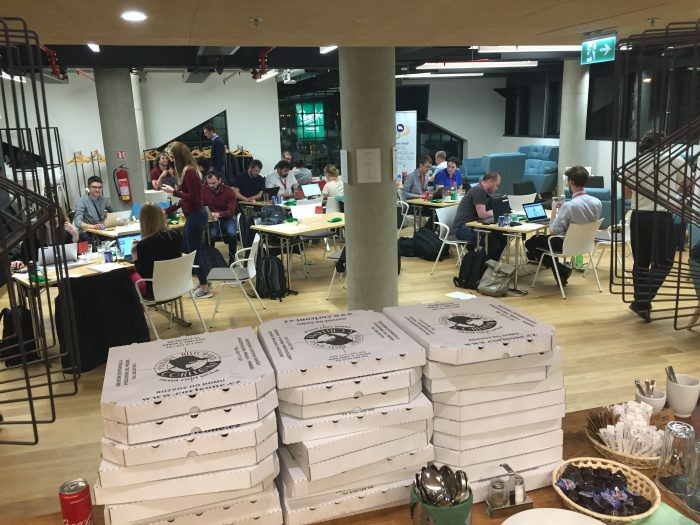 So from my experience I wouldn’t call it hackathon but rather build it day, partly also because we really plan to use the results to use in real life for real NGO customers. Four different NGOs, selected by CRM pro neziskovky, four different tasks to complete. Army of Salvation had the most common request NGOs have – automate the process of sending gift receipt, we need at the end of fiscal year. One simple button, which will generate this receipt for thousands donors and send it via email or print it with one click. And at the same time it should work for individual donor who just called he need it. At first I was sceptical about having just 4 problems and 10 teams, at the end I loved it. We really got totally different solutions and would we be able to combine them, we would get something awesome. Szandor Knapp, the great MVP from Munich, who we had as a mentor here, considered all of them pretty complex and challenging, I – as always – thought about it as something simple. Of course we are aware, that there are great applications on AppExchange we might use for these tasks, but to build something from scratch has its beauty. 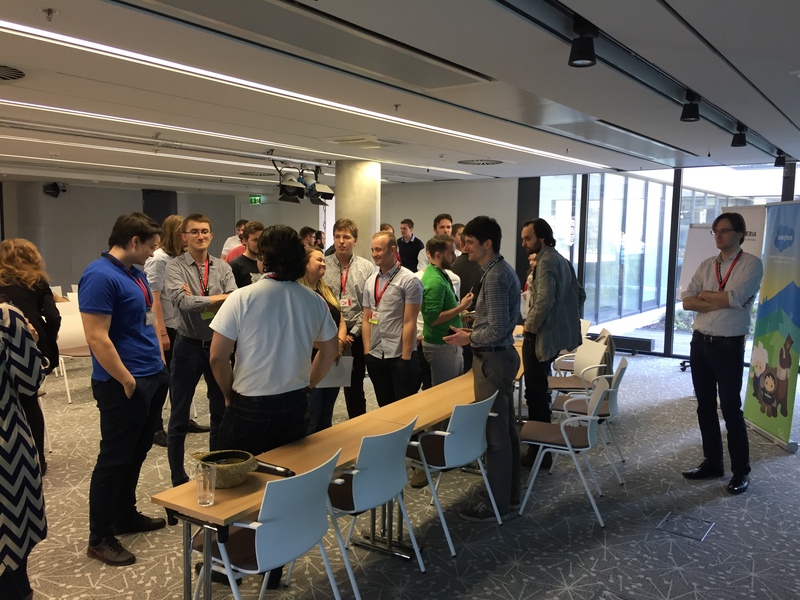 All requestors were available to the teams for several hours and they could pass as many requests and information to them as possible. Mentors were available the whole time as well as food (plenty of it) and drinks. As night progressed some teams went to get some sleep, others continued nonstop. Was quite interesting to watch them and as I write this article I have no clue, whether they will provide better solutions to those who left. The beauty of different approaches, when you can work way less than others and still deliver something similar or maybe even better. The Jury – Jan, Aleš, Zuzana and me – had a hard time. The teams presented their solutions, trying to impress all of us. We had access to their orgs to see how they did it and could check whether it really works. Can ask additional questions. First place was obvious to all of us. The rest was a bit more tricky. Should you prefer native features, which make it harder to customize by customer (eg. one team used VisualForce page to render the pdfs and we agree it is pretty easy to tweak such page, other team used Email template for the same thing and via code generated the pdf, which is even easier) or a bit of code, which makes it easier? Should we give bonus points for using custom metadata (as it is the prefered way) or custom object for configuration is better, as customers can find it more easily? Does it matter that one feature doesn’t work as the team hit some limit of Salesforce, while such features wasn’t needed? All in all, Svatopluk, Eliška and Tadeáš from AspectWorks, were obviously the best one. You can also feel it from the presentation – Svatopluk was up and running the whole night and I still consider his presentation the best one. They used Labels in their solution, handled mass email limits, allowed users to choose which email template to use and which certificate template, dynamically define groups and much more. 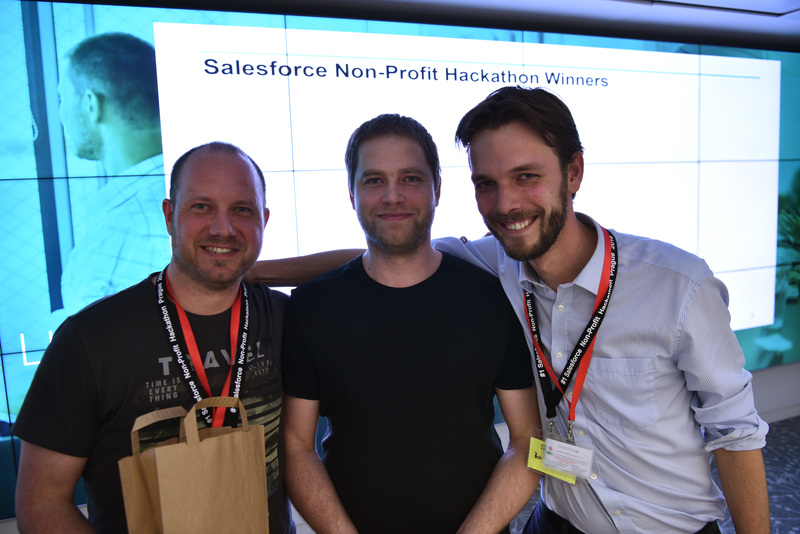 Second place went to Petr, Martin and Petr, who worked on the solution for Centrum Paraple. They also involved little eshop as part of their solution, solved the process of registration to an event as well as simple links in an email you can just click and confirm/reject your attendance. Plus solution for speeding up the process at check-in, including ability to update contact details or allow people to register themselves on a shared tablet. Third place was super hard to decide, so we decided to give it to two teams. Jan, Tomáš and Lukáš solved the problem of The Open Society Fund. Custom objects to define the structure of custom form, all the fields, their types, whether they are mandatory or not, validation rules and probably much more. Looked robust and really full of features. 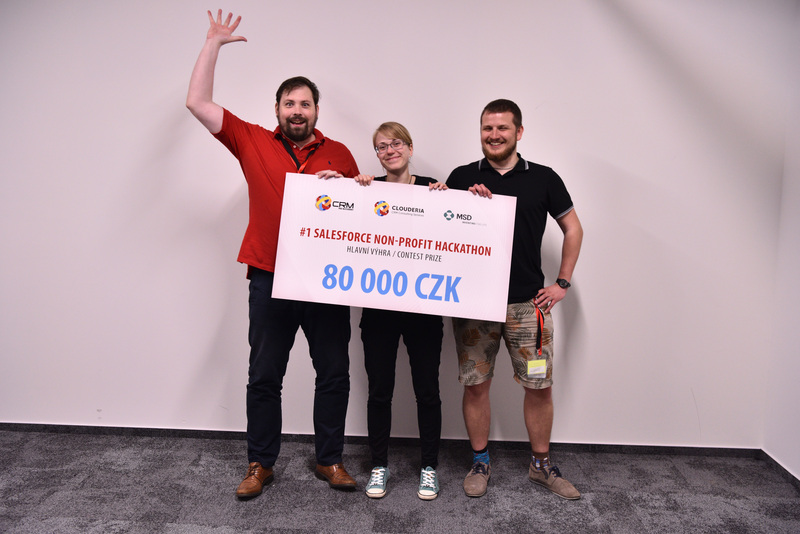 Martin, Zuzana and Ondřej from AspectWorks solved the need of ADRA for project management. All the objects they needed, some custom Lightning Components to make it nicer, some triggers which automatically completed milestones when all task have been completed and so on and on. We didn’t decide on the order of the rest of the teams. Nikita, Alexandra and Michal from Bluewolf worked on the Open Society Fund as well, incorporated Field Sets and some other features, had a nice corporate presentation, but the we liked the winning solution more. Michal and Milan from Enehano Solutions with Jakub solved the ADRA requirement, we missed a bit better cost tracking but like the idea of uploading files directly to Salesforce. Pitty that the base LC doesn’t work in anonymous community. Diego Perez, Stanislav and Martin from MSD worked on Salvation Army and really went with the 80 % customization, 20 % development process. Visualforce for printing the PDF file, email templates, workflow rules, which fire when specific flag is set in the record. Iryna, Kamila and Anežka from MSD worked on the ADRA project as well. And they went mostly customization route as well, with a nice touch of free app for visualization of the timeline (and we still have no idea why it shows months names in Czech when everything we checked was set to English). @AuraEnabled is needed to have APEX variables available in Lightning Components (of course I know it, just forget it at 8am after sleepless night). This event wouldn’t take place without partners. Clouderia, who came with the idea, organization and main price; MSD, who provided place and catering; CRM pro neziskovky, who get in touch with NGOs and helped them define their needs. As well as Enehano Solutions, who donated price for second place (Tesla for the weekend) and AspectWorks, who paid additional expenses. I should also mention the Salesforce, who provided swags for attendees! Will see, whether there will be next time, I’m really curious about it. The attendence was pretty good, all the big partners here, and the question is, whether they will be willing to attend again, as I don’t think we can find another such a big group of people. I spoke with a few of them and looks like they will take some sleep and are quite willing to do it again. Which is awesome. All photos from Stanislav Krupar, are available.